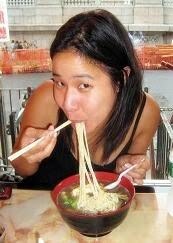 Of all the Asian cuisines, I think Indian used to be my least favorite. This was entirely my own fault. Unless you seek it out, Indian food as it's served in this country is a little bit same-y same-y: buffet-style curries that have been sitting in warming pans for who knows how long, overly-cooked vegetables, greasy naan. Then along came Kasa, which cured my of my prejudices just in time for a three-month stint living in London. I can never resist a good market, and we were living a stone's throw from Brick Lane, a treasure trove of exotic Indian vegetables, spices, and sauces. I'd never cooked in a foreign country before, and it was remarkable how many things I'd taken for granted. The measurement system, for example. Still, being away from home gave me the freedom to experiment. Since everything was a little unfamiliar, down to the electric range in our subletted flat, I had no choice but to embrace the new. My first couple of experiments were nothing special. But then, one night, I made a suprisingly successful tikka masala. Another time, it was a spicy cilantro-flecked dal that beat anything I'd tasted back home. 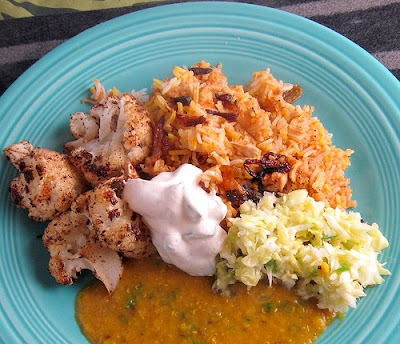 The very thing that makes Indian food intimidating to try—the preponderance of unfamiliar spices—makes it surprisingly easy to come back to. Once you've purchased that initial supply of spices, you may as well use it. As soon as we returned stateside, I bought a couple of Indian cookbooks. I discovered Madhur Jaffrey through her wonderful memoir, Climbing the Mango Trees. I've found her recipes to be precise, easy-to-follow, and (most importantly) delicious. Her chicken biryani is absolute perfection. The last time I made this, I tried to roast cauliflower at the same time and I split the difference on the oven temperature. All I can say is, don't do this. Both dishes will turn out poorer for it. I'm a fan of any spicy rice and I added quite a bit of red chili powder to the original recipe. If you prefer your food milder, you can omit this ingredient. You will need to start this roughly four hours before you plan on serving it. This allows time to prepare the marinade, two hours for marination, about half an hour of stovetop preparation, and one hour in the oven. Even though this is a fairly time-consuming dish, it is ideal for dinner parties, as the last hour of cooking is completely hands-off, leaving you free to cook any side dishes or starters you wish to serve. 1. Start by making the marinade. Peel and coarsely chop three of the onions. Place them, along with the garlic, ginger, cloves, peppercorns, cinammon, coriander, cumin, poppy seeds, mace, lemon juice, and a pinch of salt into a blender or food processor. You will also want to add the seeds from your cardamom pods (not the black cardamoms, but the pale green ones). To remove the seeds, simply smash the shell with the handle of your knife or the bottom of a bowl and remove the fragrant black seeds with your fingers. Add the cardamom seeds to the other ingredients and blend to a smooth paste. 2. Peel the three remaining onions and slice them into fine rings. Using a 10-inch, heavy-bottomed-skillet, heat about two tablespoons of oil over medium heat. Once hot, add the bay leaves and black cardamoms. Fry for about ten seconds. They will infuse the oil with flavor. Next add your onions and fry them in the oil for about ten minutes. Stir them so they cook evenly and do not burn. You want these to get golden brown and crispy. Remove with a slotted spoon, squeezing out the excess oil into the pan. Reserve the flavored oil, bay leaves, and black cardamoms. 3. Find a bowl large enough to hold your chicken. Hold back about a third of your fried onions for garnishing and let them rest on a paper towel to draw out the excess oil. Into the bowl, place the remaining two thirds of your fried onions, all of the spice paste from the blender or food processor, and the container of yogurt. Mix these together to make the marinade. 4. Break your chicken down, or, if you are not comfortable doing this, you can buy your chicken in pieces. Save the wings for another use. Remove the skin and cut the meat into largish chunks (about three inches across). I always save any chicken bones in a plastic bag in the freezer to make broth. Place meat in the marinade, mix well, and refrigerate for at least two hours. Turn occasionally. 5. After two hours have passed, take the bowl out and heat its entire contents in a large, heavy-bottomed pot with a tight-fitting lid. I use my Le Creuset dutch oven. Bring to a boil, then lower the heat and simmer, covered, for about 15 minutes. 6. In a separate pot, bring about 15 cups of water and pinch of salt to a boil. Rinse and drain the rice and add it to the boiling water. As soon as the water returns to a boil, cook rice for an additional five minutes. You do not want the rice to cook through. Drain in a colander. 7. Remove the chicken pieces to a plate, shaking any excess marinade back into the pot, and cook down the marinade paste until it is reduced by about half (about ten minutes). Turn the heat off. Put the chicken back into the pot, mixing it well with the reduced marinade. 8. Preheat the oven to 300°. Microwave the milk for about 30 seconds and add the saffron. Let this soak for a few minutes. 9. Place the drained rice on top of the chicken and marinade. 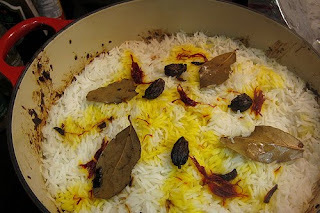 Then arrange the reserved bay leaves and black cardamoms on top. Drizzle most of the onion-flavored oil on top of the rice, holding back a tablespoon or so to fry the golden raisins. Pour the saffron milk over the rice in streaks. 10. Cover the pot with aluminum foil and place the lid on top of this, crinkling the edges of the aluminum against the side of the pot to create as airtight a seal as possible. Bake for one hour. 11. Fry the golden raisins for about a minute in the remaining onion-flavored oil and set aside. I like to show off the beautiful saffron-streaked dish to my guests as it comes out of the oven. Remove the bay leaves and black cardamom. 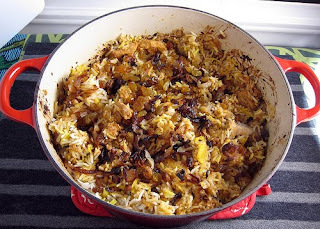 Mix the chicken and the rice together, then scatter over the fried onions and raisins. I serve this straight out of the cooking container, but you can also transfer to a large platter as Jaffrey suggests. Clearly she is a far classier hostess than I. This looks really good! I just got some organic pepper and Himalayan sea salt from Sustainable Sourcing https://secure.sustainablesourcing.com and I think I'll try them both out in this recipe. Thanks for sharing!